Work tone and texture into your room scheme with the Andorra Mosaic. This tile brings small squares of brushed stone together in a beautiful showcase of modern mosaic. The mottled stone combined with the textured finish lends a rustic appeal to the design, whilst the geometric pattern and neutral tones allow this tile to work wonders in a range of room settings. 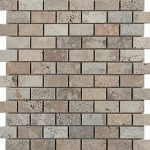 With this mosaic you can use it as a border to add stylish accents to your scheme or display over larger areas for a statement effect. 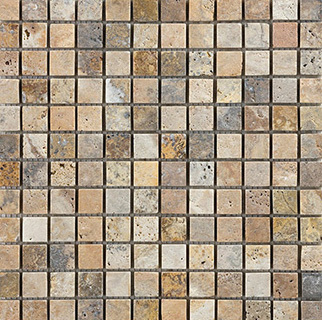 Natural stone mosaic – 305mm x 305mm x 10mm sheet size, 25mm x 25mm tile size. The tile quantities suggested are based on the dimensions that you enter and it is advisable that you always make allowances for cuts and breakages. Manufacturers’ averages are used to present quantities for adhesives and grouts and as surfaces may be uneven, more than the estimated quantity of adhesive and grout given here may be required. Atlas Ceramics can therefore accept no liability for over or under ordering. View our full tile calculator page for further details and instructions. FREE delivery is applied to sample tiles/mosaics and on orders of £250 and over including VAT (Exclusions may apply on these prices, Express Delivery is exempt from this). Yes, it is necessary to sign for your order. Please note that your signature indicates to us that you have received and checked the quantities and products and have confirmed that all is present and correct. In addition to your right to cancel your order we accept returns in accordance with our returns policy set out on our terms & conditions page.